A Purposeful Post – Hey, Look! A Writer Fellow! 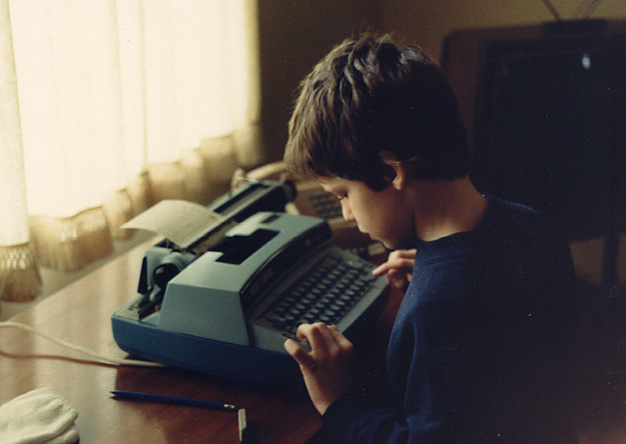 The young me and the noisiest typewriter on earth. Lordy, did I love that thing. A couple weeks back, my blog pal, Harula, posted a writing exercise. The theme was “Purpose” and the idea was to complete the following four sentences with whatever spontaneous thoughts sprung to mind. …become a “dinosaur expert.” I was fascinated by Stegosaurus and was rooting for the poor devil in his Fantasia fight with Tyrannosaurs Rex. I loved Stegosaurus so much that at times I wanted to be a Stegosaurus. Is that odd? I also was fascinated by the sheer size of Brontosaurus. He was as long as three city buses laid end to end! Dang! Who wouldn’t want to be a dinosaur expert? Many years later that I learned that Stegosaurus was extinct by the time T-Rex appeared on the scene, making Fantasia scientifically inaccurate — despite what that egghead Deems Taylor would have you believe. Then I learned that Brontosauruses never existed at all. So The Flintstones? Lies. All lies. I am still fascinated by dinosaurs today but now possess the self-awareness to understand that I am way too impatient to be a paleontologist. By the way, my favorite dinosaur has since changed. I am now a fan of Triceratops. 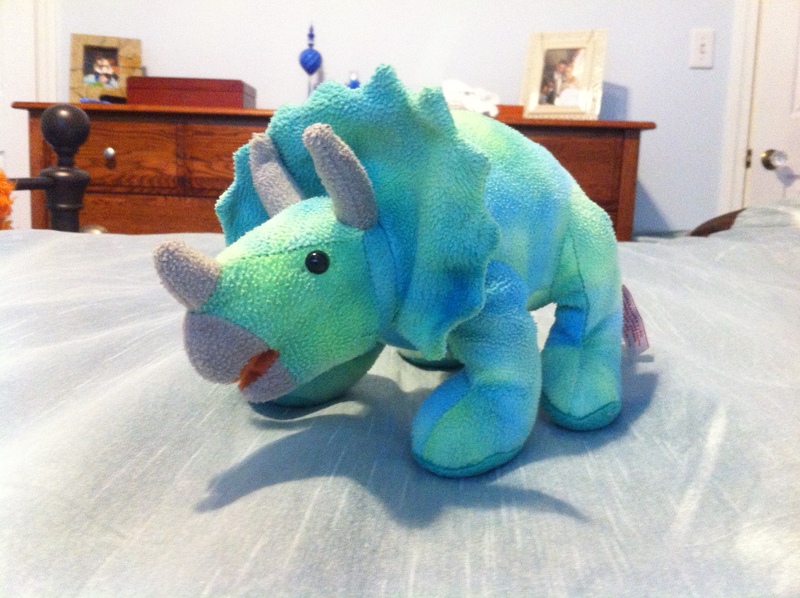 Especially the adorable and slightly derpy looking stuffed triceratops who sits on my son’s bed. This fellow has gone by many names over the years. When Alex was three, he called him Oscar Lotion. I have no idea why. Later the name changed to Susie, then Harold Lloyd, and now, simply Triceratops. I call him Oscar Lotion Susie Harold Lloyd Triceratops and pretend he is a prehistoric accountant. …be an actor. At an early age I noticed that I had a sort of fearlessness in front of crowds and could quickly remember lines. I didn’t do much acting growing up, but what I did was intoxicating. My big high school break was when I played the voice of Audrey Two in our school’s presentation of Little Shop of Horrors. I wanted to be the sadistic dentist, Orin, but I was the only one in the school who could pull off that deep, Ron Taylor voice. In other words, my high school had way too many white people. I was this guy. It was awesome. In college I lied my way into acting classes (Ha! Acting!). I soon recognized that I liked acting students much, much more than graphic design students. This was kind of a problem because graphic design was my major. Horrified by the idea of actually using this graphic design degree, I contemplated going to acting school. I auditioned for and got accepted into the American Musical and Dramatic Academy (AMDA) in New York before deciding that I have already accrued enough debt, thank you. Besides, I knew that deep down, acting was too uncertain and unstable a career for my personality. This turned out to be a wise decision, for in tandem with my passion for acting, I had developed a passion for writing. A person can write and hold a steady day job. Four short years after I graduated from college, my day job switched from graphic design to writing. I got my start as a newspaper man and found the experience to be amazing. I wrote during the day for a salary and then wrote at night and on the weekends to draw a supplementary income. In other words, I became a very happy person. And there you have it! Part two is coming soon. When you were a kid what did you believe you were meant to do? Tell me in the comments below! C’mon, be a sport! Well, who says you couldn’t belt out a few tunes traveling in China. Someone, I’m sure, could write a catchy ditty about those horrible toilets. Hmm… I got some songwriting to do! You’re a treat to read. Ha ha . Mine was be a writer, be a 911 operator, be a writer, and then … just be. Nevermind the writing. But when I was a kid and a young adult, my only thoughts were writing. I still have 50-odd spiral bound notebooks in a trunk full of the (unintentionally) silliest stories ever written. You aren’t a writer, Silly? I coulda sworn you sent stuff out. You should, you know, you write funny. Nah, I never made it. My writing is very amateur. I’m a hobby writer. I write for myself, when I feel up to it. Which hasn’t happened in at as-many-years-as-my-oldest-child. Something tells me you might wanna give writing another go. For fun, mind you. “Fearlessness in front of crowds”—Oh, I envy you for that one! I thought I was meant to be a librarian, and then a veterinarian. I think my dislike of snakes and other furless creatures turned me away from the latter. Aren’t there “Cute Animals Only” veterinarians? Because, well, there should be. Ha…Ha…Where I live, there is a CATS ONLY (your favorite pets…I mean pest) clinic. I thought I was meant to be the next visitor to Narnia. I prepped for that gig, too. When I should have been learning how to close font tags. Which didn’t exist at the time. Oops. It’s never too late, my friend! With my budget and know-how, I’d have to shove my dresser in front of the bathroom and call it a day, but I’m sure Aslan wouldn’t mind. That would be the central point to the series, yes. Do you remember what made you want to be a TV reporter. Was there a movie or something that inspired that line of thought? MOM!!! Mr. Allegra wants me to hang out in bars and start smoking! Don’t for get to tell her that I write for children! Mwah-ha-ha! When I was a young I thought I wanted to be a dancer in NYC. I started dancing when I was in the 3rd grade all the way through high school. But then I went to a dancing camp one summer and got a real dose of what that life would truly look like and knew it was not for me. I majored in Psychology in college and even though I didn’t finish my degree, what I learned has served me well. I use a lot of my training when dealing with people. Through it all, I have written. I always had a journal/diary. I wrote short stories and poetry in high school and I have taken English and Creative writing classes as an adult. I took a lot of psych classes in college; they have proven to be invaluable to me now that I write. And when you do become famous, don’t forget the little people of Blogworld. Psychology does come in handy when writing! I never thought about that…but it’s true! What? A fellow doodler? Then why have you not posted a doodle or three on your blog? C’mon now! Will be doing that soon….I just cleaned out my storage shed and found some sketches from high school that I had been thinking about lately. Your story is awesome and inspirational. You are illustrating your own stuff, of course, yes? I’m really enjoying reading about everyone’s little pieces of personal history in these posts, too 🙂 You think of great topics, Mike! I love these comments, too. But I can’t take credit for this topic (as much as I’d love to). That was Harula’s doing. Do check out her blog if you don’t yet know it. lol…thanks for the reminder! I got so caught up in the answers (and of course, I lack a lot of brain power!) I forgot your mention of that! What a charming photo of you as a child!! When I was little I wanted to be a vet or a teacher (I’m now a teacher with a dog so it all worked out minus the animal operations!). Just be careful the goat doesn’t eat your drawings! These will be “outdoor goats” I think! One never knows what goats can get up to at night though, haha! Great exercise, I love xour answers. What a close call that you were almost an actor. You could still film yourself and put it on here. Writing suits you. I’ve never had much interest in the vlog thing. Don’t know why. As a child, I loved to doodle and was pretty good at copying the comics from the newspaper and any other cartoon characters I liked. 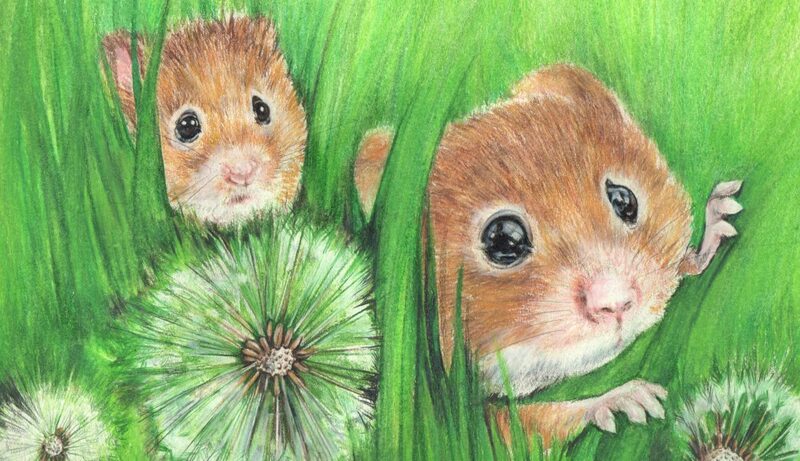 Being an artist, at that young age, seemed like the perfect career and would be a great skill, so I could illustrate my own books, since I also liked to make up stories. By the time I reached the end of sixth grade, I started looking towards my grown-up career and settled on Speech Therapy. My brother had needed speech therapy when he was little and I like the idea of working with kids on a one-to-one basis. At that age, I knew how hard it was to contain a whole class, but I did want to teach/work with kids. I did attain my Bachelor’s degree majoring in Speech, Language and Audiology, but once I got home and tried to get a job, I found that a Bachelor’s degree wasn’t enough – and by then I was married and didn’t want to leave town again to get my Master’s. Besides, having the extra degree meant I’d have far too much of an administrational position and wouldn’t be working with kids except to test them – not nearly as much fun! I’ll bet you are a wonderful teacher. You’re a good soul. Love your post, Mike. Can’twait for Part 2! Don’t people still call, ’em cartoons? Or are we old fogies? Obviously, your third grade dreams weren’t too far afield. Your animation concept stuff is amaaaaazing. Oh, do tell me you have a picture of you wearing that button-on bug t-shirt. When I was a kid I wanted, and I quote, to be eccentric. When I was a teenager I wanted to stay home and color. So technically I’ve reached my goals in life. My parents are so proud. I would think the coloring would be in the kid part and the eccentricity thing would be in the teen part. No, I’ve always been weird. And I still love to color. Shouldn’t we all love to color? I mean, come ON! It’s fun! For the life of me, I can’t recall wanting to “be” anything until I was in college. I was too busy “being.” In college, I wanted to “be” a dancer. Between that and wanting to “be” a writer, I settled for engineering. Fast forward 10 years, and I had left IBM and engineering for writing. There’s a rondelle there. Hmmm. My life has a literary arc. I’m glad you didn’t settle for settling. I’ve seen too many of my friends and colleagues do such things and it kills me a little. I love your answers to these questions. It’s rather endearing that you wanted to be a dinosaur expert! I may be mistaken, but is that Trixie from Toy Story 3? I changed professions like a girl changes clothes. I wanted to be a painter, then a writer, then a pediatrician, then an archaeologist, then a detective, then a graphic designer, then an architect. Ultimately I became a translator/writer/editor; even as an adult I couldn’t settle on just one thing! Oscar Lotion Susie Harold Lloyd Triceratops the Accountant is not Trixie, but she may be a distant relation. I’ll ask him. I love how you kept your mind open regarding your career. A Renaissance Woman such as yourself should handle life choices in no other way. Hmm… Perhaps acting can be your retirement gig. Ya nevah know! I had always wanted to be a writer. But really now I’m thinking I might’ve been put here to be a court stenographer — I mean I have always been fast with my fingers — I was a really fast cashier at Waldbaum’s Supermarket in 1983, and I became a really really fast typist — before autocorrect I typed 87 wpm with 1 error — ha! 87 wpm? Dang! I’m envious! I’m sort of like 25 wpm with lotsa errors. A ballerina of course. Had the lessons, kept the tutu, and the photos prove the adorableness of dancing on stage. I quit when my teacher moved on to ice skating. That didn’t last either. I do still enjoy cocoa, which is part of rinkside life. My fifth grade teacher wrote across a poem “you should be a writer.” That stuck as well as my thoughts of being a teacher or librarian according to my high school yearbook (which I burned–now there’s a post in the making). Cocoa is part of what makes a figure skater? Awesome! I’m part figure skater! I’m gonna put that on my resume. I had a similar teacher experience, but for me it was in sixth grade. Have you yet read about the Amazing Mrs. Snelback? And I eagerly await your yearbook burning post. Your comment reminds me of my niece: When she was a tyke, she decided she was going to be a dancing maid who threw footballs. As a kid I loved dinosaurs!!! But I didn’t want to be a paleontologist, I wanted to be a cop! I was required to be home and in pajamas by 5 o’clock and when I wasn’t fighting with my sisters, I was watching TV. Adam 12 was one of my favorites and I was going to be just like them…keeping the streets safe and getting the bad guys off the street. By my early teens I had fallen in love with Modern Dance and wanted to be a dancer. I loved choreography and had a blast creating a dance to Mancini’s Pink Panther theme. Ten years after doing this I ran into a girl I had gone to school with and she just gushed about what a great dancer I was, she assumed I was still dancing. The compliment was awesome but I’d given up dancing long ago. I think my inspiration came mostly because I like the dance teacher and she encouraged me…plus, I really wanted to do gymnastics and though I rocked on uneven bars, I just was not flexible enough to do all around gymnastics…so dance was my fall back activity. Before my daughter was born, I wanted to be a lineman for the telephone company. I had always had a fascination with phones and as a kid, I used to take them apart, change cords, disconnect ringers, etc. I wasn’t afraid of heights either…walked along the top of fences, jumped off my roof and even climbed the telephone pole that was in the corner of my yard. My mother was a telephone operator and got me a job at the telephone company as an operator. It was going to be a step into the company…toward my goal…and then I opened some of the books that I would have to study and all the electrical symbols and formulas looked like Greek to me…That was the end of my dream to be a lineman. I NEVER dreamed of being a teacher…but things change after children…all of those other things seemed unimportant. Oh, that is a great story, Mrs. P! I, too, loved cop shows as a kid (Dragnet, especially) but they made me want to act more than be a cop. Or, rather, they made me want to talk as fast as Jack Webb. Nobody could deliver a self-righteous monologue as fast as good ol’ Sgt. Friday. And now I have Glen Campbell’s “Wichita Lineman” stuck in my head. Really? “The Flintstones” were all lies?! I’m devastated. My whole childhood was a sham. The only thing I can remember wanting to be was a photographer (did that), a film maker (TV Producer) and a Dancer. Isadora Duncan was my hero and I wanted to live her life. Alas, I have no co-ordination so it is a good thing I was good at photography and TV Producing. I know! And don’t try to use a bird’s beak to play records. It ruins the records and annoys the bird. And, wait, a TV Producer? What did you produce? Probably nothing you have ever seen. I was the Station Producer at CTS. A Canadian station that played a lot of religious programming and a lot of family friendly strip programming. That’s when you get a series like…Seinfield, Happy Days, Dr. Quinn, How I met your Mother, etc. that start selling the old seasons to stations that aren’t the original Network. They are usually played over and over on a daily basis as opposed to a weekly basis. I loved Isadora Duncan too…and Martha Graham. I wonder if there was a Modern Dance revival when we grew up? Maybe, but I think the attraction for Isadora for me was how comfortable and free she always seemed in her own skin. I suspect their are a lot of people who love to move to the music with wild abandon… in the privacy of their own home. You’re a woman of many talents, my friend. Your post has purpose. It is to help me on my way to find purpose! When I was a kid, I believed I was here to teach my classroom of stuffed animals all about reading, writing and arithmetic. Ok, maybe not so much the arithmetic. Or to color the world, because I loved coloring and still do! Teenager, I thought I was here to…HAVE FUN! Not much insight there! Teaching stuffed animals is a noble calling. Even in this day and age the illiteracy rate among Steif bears is alarmingly high! I love that picture of you at the typewriter so so much I can’t tell you! Those are some tough questions to answer, I look forward to your further responses. In my youth I believed I was here to be a dancer. Sigh. But you ARE a dancer! And I am too! There is photographic evidence right there on your blog! Wowza, those are some serious prompts! I, like everybody else, love the typewriting pic. So often I find myself missing my typewriter from back in the day. It was such an efficient way of writing and you didn’t have to stare at a damn screen all the time. Personally, I love the clickety-clack…makes me feel like I’m doing something. 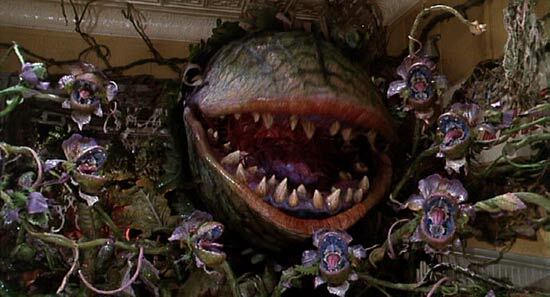 Jealous of your “Little Shop of Horrors” part. That’s too awesome! I love Harula’s writing exercise, and am going to steal it for my writing class – THANKS Harula and Mike. I dislike being so honest in front of strangers, but that’s what we writers do. When I was a child I believed I was here to save the world. I also believed I was an alien, so the two beliefs made sense. Sometimes, they still do. As far as your purpose(s), all I can say is that when you, at an early age, “noticed that I had a sort of fearlessness in front of crowds,” you were right on (write on?). That’s what writing is all about – a fearlessness in front of crowds. How wonderful to keep your purpose throughout childhood, teenagedom, and now adulthood. While many writers are fearless in presenting their written words to the public, I would argue that they are far less confident in presenting themselves. I never cease to be amazed by just how many fine writers use their valuable public speaking time to hide in the dark and parrot what is written on a PowerPoint screen. “Oscar Lotion Susie Harold Lloyd Triceratops and pretend he is a prehistoric accountant.” Have you seen the Gene Wilder Young Frankenstein? This line had me full on laughing on chuckle-snark-derivatives like Igor. Yeah Donna, I think Kate D must have been a squirrel lover too! That dog voice translator collar is exactly what I wanted to invent for the squirrels. So THAT explains why you speak of squirrels so often! I, too, am a fan of those fuzzy buggers. Once I chased a feral cat off of my lawn and, I swear, a dozen of them cheered me on from the treetops. It was awesome. I felt like a celebrity. Wait, wait, wait – were you the inspiration for the picture book Those Darn Squirrels? Are you Old Man Fookwire? whoa. I thought I was supposed to be a vet. My experience with high school science classes scared me away from that, and part of me regrets that… Imagine, cute furries all day everyday! Your job, Sweetie, should be that of a petting zoo owner. Let’s work toward that, shall we? It was a fantastic prompt, my friend! Part Two will debut tomorrow. This is a good and fun read. Thank you. And, I invite you again to go on over the http://toullasstory.wordpress.com/ for the latest installation of the fiction-in-progress Toulla Laid Down Her Gun. The process of writing this magical fiction is very organic since as the author, I’m also being carried along by the story as it unfolds each week. Please join in. See if it grabs you from the first few lines.